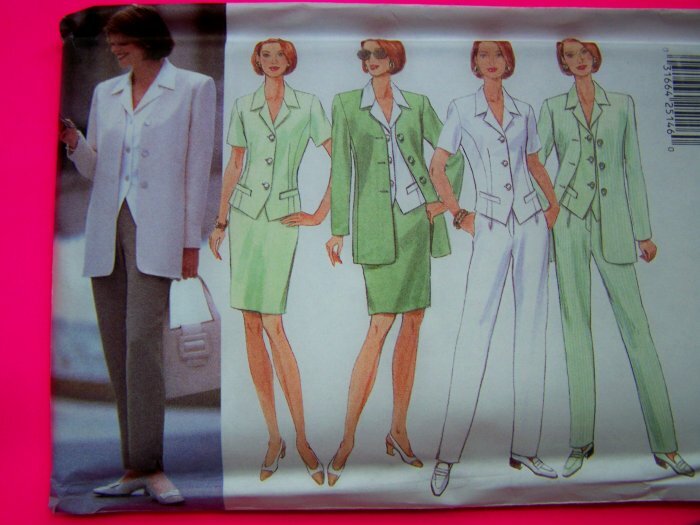 1997 Butterick Todays Wardrobe sewing pattern # 4888. Misses sizes 12 - 14 - 16. Jacket, top, skirt and pants. Loose fitting, unlined below hip jacket has shoulder pads, princess seams and long sleeves. Loose top has collar, side panels, no side seams, welts and short sleeves. Semi fitted, tapered skirt, above mid knee or tapered pants have waistband. Skirt has back zipper and slit. Pants have front pleats and side pockets slits. More new and vintage sewing patterns listed. ** Uncut, all pieces included with instructions. More new and vintage sewing patterns listed. Measurements: Bust 34 - 38". Waist 26 1/2 - 30". Hip 36 - 40". Suggested fabrics: Crepe, faille, linen, silk like broadcloth and lt wt gabardine. *Some envelopes are torn, have writing, have edge curling. S & H to the USA is $2.00 and $1.00 for each additional sewing pattern. S & H to Canada $3.25 and $1.00 for each additional pattern. **For paypal combined shipping you must make 1 payment, otherwise I can't combine to save you money. ** Payment due in 7 days. I Have over 10,000 new and vintage sewing, crocheting, knitting, plastic canvas patterns in stock.